Just a few windy miles up Highway 1 from our creamery in Point Reyes Station sits Bianchini Ranch, a 705-acre farm that is home to Bivalve Dairy. Owned and operated by John and Karen Taylor, Bivalve’s 200 Holstein cows provide the rich, organic milk that is the base for our Red Hawk, Inverness, seasonal and fresh cheeses. Karen, a sixth-generation dairywoman, grew up on Bianchini Ranch and learned dairying from her parents who came from dairy families in Sonoma and West Marin County. John, an engineer by trade, also grew up immersed in agriculture in Northern California. 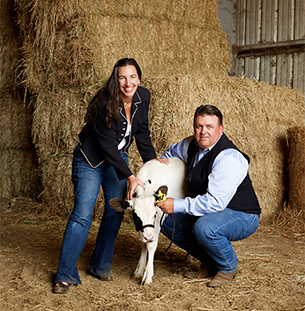 After Karen’s parents passed away, she returned to the family business with John in 2006, and together they transitioned the herd and facility to an organic operation, establishing Bivalve Dairy. Overlooking the Tomales Bay, Bivalve Dairy is an organic-certified, pasture-based operation that thrives on the health of the land.The frequent foggy, cool, damp weather in Point Reyes allows the grass to be lush and green for longer periods of time, enabling a long pasture season for their cattle. Through sustainable farming practices, such as rotational grazing, John and Karen are able to utilize the pasture to its fullest capacity. They maintain rangeland by seeding with a no-till drill and they irrigate their fields with manure from their own cattle as well as the runoff rainwater stored during the winter season to help with water conservation.The family is also using state-of-the-art computer technology to monitor each cow, it’s health and the quality of milk produced. Bivalve Dairy is certified by USDA Organic and by the American Humane Association for high standards of animal welfare practices. In 2018, Marin Agricultural Land Trust (MALT) purchased an agricultural conservation easement on the ranch which will protect it as farmland in perpetuity. John and Karen have three children: Camilla Kathleen, William Joseph (Billy Joe), and Eva Kathleen.